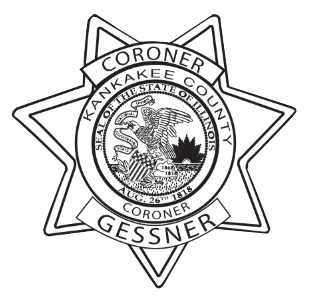 The Kankakee County Coroner's Office investigates all deaths occurring in Kankakee County. Click Here for a Complete Listing of All Coroner Related Laws. The Coroner's Creed establishes questions that must be answered to fulfill the requirements of these investigations, as well as provide care and justice for the deceased and for the family and friends of the deceased. These questions are: who, how, where, when, and why? This can be answered by determining when the deceased was last seen and how much time has passed since that time. This provides a frame within which death must have occurred. Determining the actual time of death, however, is very difficult to do. As a result, while an approximate time of death can be determined by asking the previous questions, the time of death as recorded by the Coroner's Office is the time at which death is confirmed upon responding to a call. This question asks why a person died in a given situation. As explained in the question of how above, the answer to why a person died will be the particular medical reason for death. In an accident, for example, head trauma would explain the reason why death occurred. In other words, the question of why can be answered by determining the particular cause of death. Determining the medical history of the deceased can also provide insight into why a person died. It is also important to know what medications were in the possession of the deceased at the time of death. Why a person died can ultimately be determined through autopsy and toxicology tests. It is possible, however, that why a person died cannot be determined by autopsy or toxicology results.